• Before setting up a campfire, be sure it is permitted. Check with your local fire department. 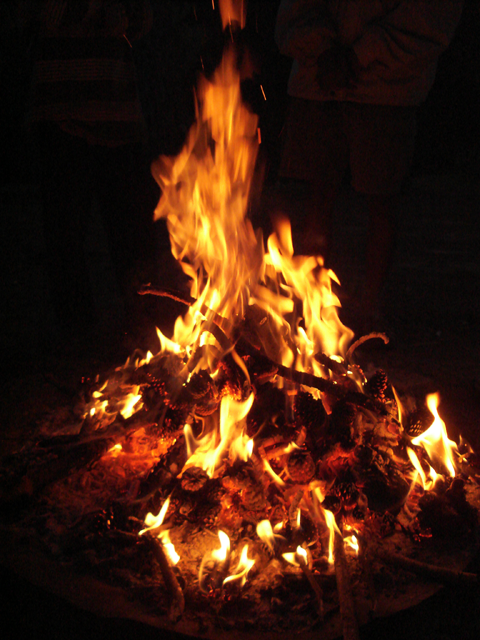 • If campfires are permitted, they need to be at least 25 feet away from any structure and anything that can burn. • Clear away dry leaves and sticks, overhanging low branches and shrubs. • Avoid burning on windy, dry days. It is easier for open burning to spread out of control when it is windy and dry. • Watch children while the fire is burning. Never let children or pets play or stand too close to the fire. • Attend to the campfire at all times. A campfire left alone for only a few minutes can grow into a damaging fire. • Keep a campfire small which is easier to control. • Never use gasoline or other flammable or combustible liquids. • Always have a hose, bucket of water, or shovel and dirt or sand nearby to put out the fire. Make sure to put it completely out before leaving the site. • If your clothes catch fire, stop, drop, and roll. Stop, drop to the ground and cover your face with your hands. Roll over and over or back and forth until the fire is out. • Treat a burn right away. Cool the burn with cool water for 3 to 5 minutes. Cover with a clean, dry cloth. Get medical help if needed.